The economic fallout from Brexit will keep Britain in the red for at least another five years and extend austerity into a second decade, Philip Hammond has revealed. In his Autumn Statement, the Chancellor said borrowing will rise by £122 billion with almost £60bn of that blamed on higher inflation and a slump in growth caused by the vote to leave the European Union. Warning of the need to ensure the economy is resilient ahead of Brexit, Mr Hammond said he will help pay for new investment and tax cuts by pressing ahead with the bulk of predecessor George Osborne’s cuts to benefits. He insisted the UK economy has “confounded commentators at home and aboard” by continuing to grow despite the shock of the Brexit vote, but its cost was laid bare in official forecasts from the Office of Budget Responsibility (OBR) revealing debt will peak at 90.2 per cent of GDP by 2018. 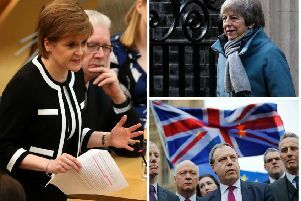 Labour said the Autumn Statement signalled “the abject failure of the last six wasted years”, while the SNP said figures revealed the scale for the “Brexit bombshell” that had hit the UK economy. Overall, by 2021 the economy will be 2.4 per cent smaller than it would have been without the EU referendum result. Next year growth will fall by a third compared to pre-referendum forecasts, with GDP rising by 1.4 per cent in 2017 and 1.7 per cent in 2018. Thus the Chancellor abandoned Mr Osborne’s goal to balance the UK’s budget by the end of the current parliament, committing only to run a surplus “as early as possible” after the next election. In the meantime, he promised to bring borrowing down to within 2 per cent of total spending and that debt should fall as a share of GDP by 2020. Focusing borrowing on infrastructure, he pledged to tackle “long-term weaknesses” in the economy with an investment package designed to increase productivity. At the centre of that effort is a new £23bn infrastructure fund, a suite of measures to increase house building in England, and improvements to road and rail links outside of London. The announcements will produce an £800m windfall for Scotland through the Barnett Formula, which the Scottish Government can invest in capital projects. Mr Hammond committed the government to further investment on skills and infrastructure in Scotland, announcing the start of talks to deliver a City Deal for Stirling potentially worth tens of millions of pounds. Alongside previously agreed deals for Glasgow, Aberdeen and Inverness, and those under negotiation for Dundee, Perth and Edinburgh, the announcement means every city in Scotland will get its own investment package to stimulate economic growth. However, there was anger among north-east MPs that the Autumn Statement contained no stimulus for the struggling oil industry. Middle-class tax cuts for will not apply in Scotland, where the higher rate threshold is being frozen. But the Scottish Government will go further in increasing in the tax-free personal allowance, raising it to £12,750 compared with the £12,500 in the rest of the UK. Motorists will see fuel duty frozen for a seventh year, saving drivers about £130 per year. Car insurance premiums are also expected to fall by £40 a year under a crackdown on bogus whiplash claims. However, the Treasury has mounted another raid on insurers, with tax on insurance premiums rising by 2 per cent to 12 per cent. Tax-free perks for employees who pay for gym memberships, school fees and holidays via salary sacrifice will be withdrawn, although deductions for pension payments and cycle-to-work schemes will remain. And the Treasury will seek to raise an additional £500m by 2021 with a new crackdown on tax avoidance and evasion, including clawing back unpaid tax from Employee Benefit Trusts, the financial device at the heart of a legal battle between HMRC and Rangers Football Club. But there was a warning to pensioners that the “triple lock”, which guarantees their income will rise by in line with earnings, inflation or at least 2.5 per cent every year, will be reviewed and could be abandoned after the next election. Mr Hammond said he would stick to commitments on the triple lock, ringfenced spending on health, defence and schools, and the target to spend 0.7 per cent of GDP on foreign aid only until 2020.